When a sailor has to jump overboard clad only in his skivvies, you know his ship is in dire straits…and so is he! That’s what happened to Arthur Middleboro, the ship’s purser. It was after midnight when he swam to a raft drifting in a raging storm and joined five other survivors in a 60 hour life threatening ordeal. When the chief engineer died from exposure, the purser took the dead man’s coveralls for protection from the cold temperatures at night and the scorching heat of the day. Only five survived the sinking of the S.S. Manasoo, a 178-foot cargo/passenger ship that went down in a storm on Georgian Bay, Lake Huron, September, 1928. Reports claimed the vessel foundered due to the shifting weight of over 100 cows huddled in pens aboard ship. This was a possibility, but a leak in the stern—perhaps caused by an open door or hatch–was most likely the primary culprit. Newspaper headlines screamed, “Curse of the Manasoo,” referring to the seafarers’ superstition that a ship’s name change brings bad luck. Originally owned by the S.S. Macassa Hamilton Steamship Company, the Scottish built vessel sailed between Toronto and Hamilton, Ontario, Canada, for 14 years. It was sold to the Owen Sound Transportation Company of Ontario in 1928, the same year of its demise. Renamed S.S. Manasoo, its new moniker reflected the primary ports of call, Manitoulin Island and the “Soo,” a nickname for Sault Ste. Marie, Ontario. But it also brought with it a hex that was never broken. The unforeseen sinking scenario occurred in three to five minutes. Feeling a sudden reduction in speed, Captain John McKay sent the first mate below to see what was happening. As soon as the mate left, the captain felt a list at the stern and turned toward shore hoping to beach his craft near the Griffith Island Lighthouse. As water poured into the engine room, it doused the fires and left the ship a drifting casualty. Only one lifeboat was launched and it flipped over in the swirling water. Two men clinging to it watched their ship roll and slip stern first to the bottom. They, in turn, were lost. Sixteen of the 21 people on board died along with all the cows and one bull. The five survivors included Capt. McKay, three of the crew and one passenger, cattleman Don Wallace who owned the cows. He had purchased them from a farmer on Manitoulin Island and was shipping them to the mainland for sale. Fortunately, there were few passengers aboard. The tourist season was ending and boards were lashed to the cargo deck stanchions to make temporary pens for the livestock. After suffering for two and a half days, the survivors were rescued by the S.S. Manitoba sailing its regular route from Port McNicoll to Sault Ste. Marie. In June, 2018, a seasoned Great Lakes shipwreck diving team, Ken Merryman, Jerry Eliason, Cris Kohl and Jared Daniel, found the S.S. Manasoo in 210 feet of water. 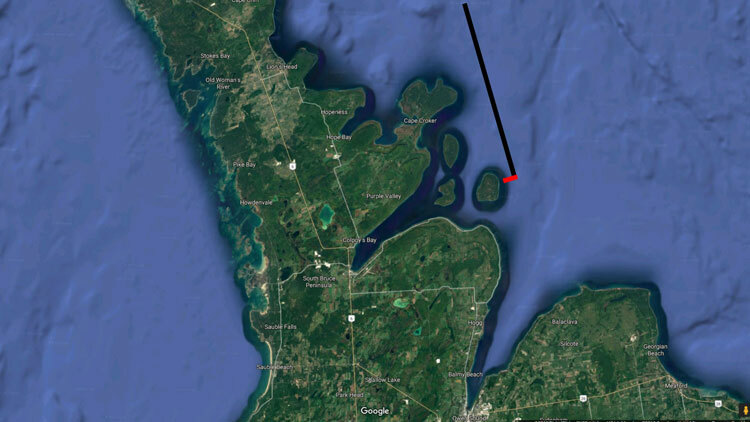 It had come within a half mile of Griffith Island, near Colpoys Bay, before succumbing to the storm. Although these divers had discovered other wrecks in the lakes, this one had an identity all its own. Kohl added, “Because the stern sank first and got buried in the sand, the front rises up intact with many amazing features. 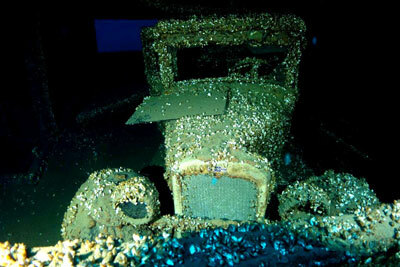 I know of no other shipwreck in Lake Huron with an automobile parked inside.” He was referring to a 1927 Chevrolet AA Capital two-door coupe that belonged to Wallace, the surviving livestock broker. The team was not just in awe of the automobile. The pilothouse, usually the first part of a ship to be swept away in a storm, remained intact along with the ship’s wheel and compass. Working under an Ontario archaeological permit, the divers cautiously peered into the pilothouse, cabins, cow pens, cargo holds and dining salon on the newly discovered sanctuary. 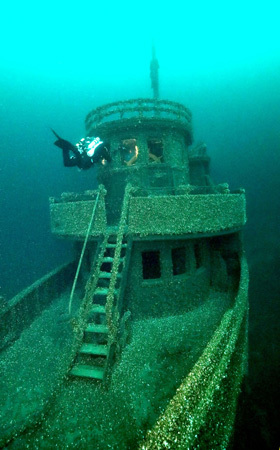 What’s next for the intrepid adventurers who seek elusive Great Lakes shipwrecks? Kohl, who plans to write a book, says he suspects there are 7,000 shipwrecks in the lakes, but figures only 2,000 of them have been found. This leaves the “pool open” for further exploratory ventures in hopes of finding another new shipwreck…preferably one that hasn’t been renamed. Ells: This wreck was new to me. What a story and what a fantastic photo. The state of preservation is amazing! Hi Jack: Many thanks for your comment. Interesting that I thought the same thing as you. What an amazingly intact ship. It was Dirk Cussler who called my attention to this wreck. Somehow I missed the discovery last summer. Ken Merryman said the visibility on the wreck site was 70 to 100 feet. Gosh, discovering an intact vessel in crystal clear water… indeed a diver’s dream! This was a fascinating article. I love the story, but am sad about the loss of lives. The divers deserve a lot of credit for the discovery. Do you think the automobile will be salvaged? Thank you! This is a good question. No, I don’t think anything will be salvaged from the Manasoo. First, it belongs to the Canadian government and when lives are lost, the shipwreck becomes a sanctuary and the remains are not to be disturbed. Second, it would be an expensive expedition and third, there is a possibility the 1927 Chevy coupe might break up when disturbed. 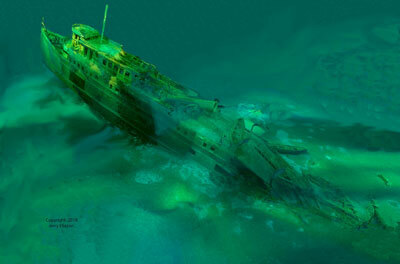 Although the wreck is too deep for recreational divers, tech divers can see it and photograph it. Thus this intriguing wreck remains intact, a tribute to maritime trade on Lake Huron in earlier days. It looks as though the wreck of S.S Manasoo is encrusted in gold, absolutely magical. I have spoken with two divers who were fortunate enough to visit the Manasoo. Both of them were extremely impressed with the marine life. Although they didn’t use the word “magical,” their comments indicated it was just that.